The town now known as Whitley Bay seems as embedded in the popular culture of the North-East as any other place you care to name. It is as utterly distinctive to us locals for what it is and what is once was as anything else in the region’s rich history. And the splendidly named and beautifully formed landmark that is the Spanish City dome is unmistakable. But the town’s name hasn’t always been as instantly recognisable. The name ‘Whitley’ goes way back, coming from the Old English wyt-leah, meaning ‘white meadow or pasture’; but it was for many centuries known simply as Whitley, and was a tiny place by today’s standards. In the Victorian era, however, it seems to have been known as Whitley-by-the-Sea, so as to distinguish it from Whitley Chapel and Whitley Castle in Northumberland. Then, in around 1902, the seldom used ‘by-the-Sea’ bit was dropped and replaced with ‘Bay’, allegedly to avoid confusion with Whitby in Yorkshire. But wherever did the ‘Spanish City’ come from? The answer is remarkably simple. In 1904, a merry band of entertainers known as the Toreadors Concert Party entertained visitors in an open-air theatre in Whitley Park. They had been brought there not from Spain, but from a few miles down the road by Mr Charles Elderton, who ran Hebburn’s Theatre Royal. For the occasion, the area was decorated in the Spanish style, and it became known as ‘the Spanish City’. 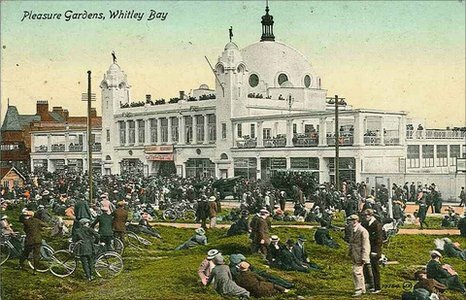 It grew to be so popular that within a few years The Whitley Pleasure Gardens Company Ltd. was formed and a large fairground was established on the site. By 1910 the famous Dome was complete – in the Moorish style – and a legend was born. The Backworth Treasure, or Hoard, amounts to a collection of gold and silver objects found in 1812 – supposedly in a field near Backworth. As you can see, there’s a lovely silver pan, three spoons, a couple of brooches and several items of jewellery. There is also a single coin. The hoard is something of a mystery. Not for what it is or represents – it is almost certainly an offering to the mother-goddesses, buried in the 1st or 2nd century AD – but rather for its somewhat circuitous route to its current home in the vaults of the British Museum. According to the esteemed British historian and archaeologist, Francis J Haverfield, who was at his academic peak around a century ago, the collection of goodies was first sold by its unknown discoverer to a Newcastle silversmith. They were then “all, or nearly all” resold to a Mr J Brumell, a Newcastle collector, from whom most of the objects passed, eventually, into the care of the British Museum in 1850. No one seems to quite know where the reference to Backworth came from, nor is there any solid evidence as to its exact date of discovery. 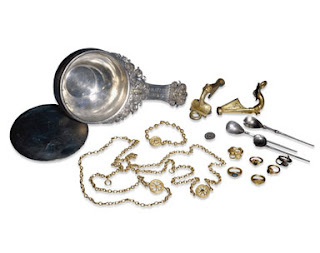 Furthermore, various descriptions of the find and its contents vary, suggesting that the treasure has been somewhat ‘diluted’ over the years as it passed between dealers. There is a clear suggestion that an 18inch-long silver dish has disappeared, and that there was not one, but in excess of 280 Roman denarii coins rattling around inside the silver pan. Inscriptions found on the goods leave us in little doubt that they were buried as a dedication to pagan deities. Anyway, despite its cloudy history, we’re happy to claim the tidy little treasure as one of our own. Camperdown is a settlement squeezed between the little village of Burradon to the north and Killingworth to the south, in the upper reaches of what is now Tyne & Wear. It does not loom especially large in the history books, but its presence on the modern-day map is the result of a curious and pretty much undocumented series of events. The place didn’t even exist until the 1820s. But with the sinking of Burradon pit in 1820 and the construction of the Seaton Burn waggonway in 1826 a few buildings began to appear, and the small collection of streets came to be known as Hazlerigge, after the name of the local landowning family. However – and no one seems to know quite why – the inhabitants of the little place soon began referring to their new village as Camperdown, with the first reference appearing in the local parish register in 1840. The new label almost certainly came from the famous battle of the same name fought between the British and Dutch in 1797. Camperdown was an important and decisive victory during the Napoleonic wars, and was probably the biggest battle we’d ever won at sea at the time. It was not uncommon for places to be named after such important events, and interest in the Battle of Camperdown continued for many, many years after 1797. As for the name Hazlerigge, well, this continued to be used somewhat loosely in the area; but by 1872, the Newcastle Weekly Chronicle reported that the old name was no longer being used by the residents and that they preferred to use Camperdown. And so it eventually became official. Now you’re probably looking at your map and thinking, hold on a minute, I know fine well that Hazlerigg (no ‘e’) still exists, so what exactly are you talking about? Well, yes, the name did indeed live on – well, after a brief gap, anyway. In the 1890s, when a new coal pit was sunk a couple of miles to the west of Camperdown near Wideopen, the name Hazlerigg was adopted by the new settlement which subsequently developed around the pit-head. So now you know. For much, much more on the history of Burradon and Camperdown see http://www.burradon-camperdown.co.uk/ . The man in question was, supposedly, a black prize-fighter resident of the Northumberland village – some sources placing him in the eighteenth, others in the nineteenth, century. No amount of research seems to be able to pin this chap down, which has led many to suppose that he may be a fabrication of the artist’s imagination – like so many other of the characters depicted in the famous painting. But “of Seaton Burn” is really quite specific, others say. Surely such a man must have existed? Maybe they’re right. But maybe he wasn’t black after all. As some of you may know, one of the most famous boxers of all time, Tom Cribb, was also known as ‘The Black Diamond’ on account of his routinely filthy appearance as a coal heaver at Wapping Docks at the turn of the nineteenth century. Now Cribb never lived in the North-East, but there would certainly have been plenty of other pitmen pugilists around at the same time, one or two of whom no doubt borrowed Cribb’s famous nickname. The debate is an interesting one, and can be followed further here – with more on Irving’s painting here. Would look at the blackleg miner. St.Mary’s Lighthouse has adorned the coast of Northumberland for over a century. Brilliant white against an azure sky, it presents one of the county’s finest summer sights. The rocky, tidal outcrop 2½ miles north of Whitley Bay, known as St.Mary’s, or Bates, Island, has been home to a light of sorts for the past 400 years. It was not until 1898, however, that what may be called a proper lighthouse was erected. Its light burned for 86 years, being decommissioned by Trinity House in 1984. It was then bought jointly by the local council and others for the benefit of the community, and soon reopened as a tourist attraction. The island is linked to the mainland by a concrete causeway which is covered at high tide, leaving the island itself separated from the shore by a short strait. The island has been extensively used over the years. It is thought to have been home to hermits prior to the construction of a chapel dedicated to St.Helen in the late eleventh century. Mention is made even at this early time of the maintenance of ‘a light’ in the tower. A burial ground existed next to the chapel for 700 years, but by 1860 all remains of the building had disappeared. The occasional mention of the name ‘Bates’ Island is a reference to one Thomas Bates, who owned the small patch of ground in the 1580s as Surveyor for Northumberland under Elizabeth I. In ‘Smugglers’ Creek’ on the north of the island was found, in 1722, the body of Anthony Mitchell, a customs man – he was presumably killed by smugglers. A few years later, in 1739, Michael Curry, a local glassworker, was hanged in Newcastle for the murder of Robert Shevil, the landlord of the inn at Old Hartley – and his body was hung in shame from a gibbet at what became known as ‘Curry’s Point’, where the causeway meets the mainland. A plaque now marks the spot. The island has seen a good deal of action over the years. Shipwrecks a plenty, for one thing; and in 1799 the island was used to isolate cholera-stricken Russian soldiers on their way to fight Napoleon. In 1855 George McEwan and family built the present-day cottage, and even opened a pub on the island. However, following a dispute with neighbouring landowners on the mainland, the McEwans were unceremoniously evicted in 1895. Soon after this Trinity House decided to site a new lighthouse on the island and, nearly three years later, on 31st August 1898, the famous 137-step beacon was officially opened. Its lights ran on paraffin (kerosene) – and continued to do so until 1977 – the fuel being delivered every six months to the storage tanks under the tower. The oil lamp was replaced by an electric equivalent in the late 1970s, and the lighthouse became fully automated in 1979. Upon decommissioning in 1984 most of the lighthouse’s internal workings were removed. However, the building – and island as a whole – continues to serve the local community as an important tourist attraction. And you can still climb to the top! The Lighthouse was given a facelift during 2008, and now looks better than ever. P.S. To learn more about the island – and for some nice pics – see here. Note: This article, and many others besides, can be found in the author’s collection of local history material here (and scroll down to Aspects of North-East History, Vol.1). An unlikely name for a coastal village if ever there was one; but the little piece of engineering ingenuity which gave this settlement its name is worthy of investigation. You see, before it ever had a sluice, Seaton Sluice, as a name, quite obviously didn’t exist. The area around the outflow of the Seaton Burn was known as, firstly, Hartley Pans, then Hartley Haven up until the mid- to late-1600s. The tiny little natural harbour shipped salt and coal, but was prone to silting – an issue which greatly hindered the port’s economic viability. The problem was solved by the local landowner, Sir Ralph Delaval, who hit upon the clever idea of constructing a pier with sluice gates that trapped the sea-water at high tide. By opening the gates at low tide, the water would rush out and cleanse the harbour. Everyone was so pleased with the new-fangled set-up that they re-christened the village Seaton Sluice. This all happened during 1660-90. This worked with varying degrees of success for several decades; until, that is, the Delavals’ ambitions moved to a new level in the 1760s. Sir John and his brother, Thomas, decided that is was time to construct a new entrance for the village’s harbour, and set about cutting a new channel through solid rock to the east of the old entrance. A monumental task in its day, the new Cut, or ‘Gut’, measuring 52ft deep x 30ft wide x 900ft long, could be ‘sluiced off’ at both ends, thus allowing ship-loading to continue no matter what the state of the tide. Completed in 1764, the Seaton Sluice MkII proved to be a resounding success – in 1777, for instance, 177 ships carrying 48,000 tonnes of coal sailed from the harbour. The ingenious initiative also greatly helped the growth and prosperity of the local bottleworks – another Delaval family institution. All of this is still very much in evidence today at Seaton Sluice – with many more historical remnants on view, besides. The area around the village and Seaton Delaval Hall is well worth a day’s outing, though a little historical research beforehand will help the visitor appreciate all there is on offer. Strange tales used to be told by the old people of the neighbourhood of the mode of life of the Delavals in these extravagant days [late 18th century]. All the members of the family, male and female, were models of grace and beauty, the men perfect Adonises, the women worthy to contest the palm with the Cyprian goddess herself. They lived for luxurious enjoyment, love, and gallantry, the gayest of the gay, the wildest of the wild. Lord Delaval entertained an almost perpetual crowd of company at Delaval Hall. The frequent fêtes and masquerades that were given converted the house and gardens into a perfect fairyland, with throngs of gay and lively creatures frolicking and flirting about, as in the fabled isle of Calypso. The most extraordinary pranks used also to be played, to the amusement of all but the actual sufferers. The house was fitted up with strange contrivances for performing practical jokes. Beds were suspended, for instance, by pulleys over trap-doors, so that when the guests had retired after a carouse, and were just dropping asleep, they were rapidly let down into a cold bath! Another contrivance was that of partitions between sleeping rooms, which could be suddenly hoisted up into the ceiling, so that when ladies and gentlemen were retiring to rest, and had doffed all their finery, and were in various stages of undress, they were astonished to see the walls of the rooms disappear in a moment, as if by enchantment, the guests finding themselves in a miscellaneous assembly of both sexes in the oddest and most embarrassing plight imaginable.